Only a little less two weeks to go until we can finally get our hands on the most-awaited Pixel 3 and Pixel 3 XL. In the meantime, we’ll settle on the small leaks Google has been showing us the past few days. Ladies and gentlemen, here are everything we know so far of this new flagship. Google released a teaser on October 14 showing three aligned phones with a big “coming soon” above, Google’s “G” logo at the bottom, and a background of white, black, and mint colors. Go ahead and visit it. You can rotate your device side-to-side to move the outline of the phone on the page. Tapping your screen will cycle between the three different colors suggesting that they will be the available colors for the Pixel 3 and 3 XL. White and black are pretty obvious. We’re excited about the mint! On September 17, Google shared another teaser showing that there will be a fourth color available for the upcoming Pixel phone. Along with the three colors mentioned above, the fourth color appears to be pink. It’s unnatural for Google to release a smartphone in four different color options. The fact that they’ve decided to step it up for the Pixel 3 / 3 XL, means the flagship really is something. What’s more interesting is programmers started digging into the source codes and they’ve uncovered something very surprising. They’ve mentioned that they’re seeing blue and green colors as well. If indeed true, then the new Pixel phone will have five or six colors to choose from. The most recent leak we can find for Google Pixel 3 and Pixel 3 XL are the photos posted by Newbie Mobile claiming that it should’ve been the official renders of the upcoming flagship. The renders show a normal Android phone look – slim bezels on both top and bottom. The regular Pixel 3 doesn’t have a notch, while the Pixel 3 XL has a notch and it comes extra-large as well. The wallpaper shows a large “3”. The same style we can see in the Google Store promo page. The single rear camera is located in the upper left corner along with the flash and sensor, and the fingerprint scanner is located at the middle-back. Taking a closer look at the Google Search Bar at the bottom, we can notice a Google Assistant icon that looks strangely familiar. This is the same icon Google leaked when they announced they’re working on a better Sound Search via Google Assistant. If they’ve already done that, then we’ll be enjoying a new and improved Assistant right out of the box. 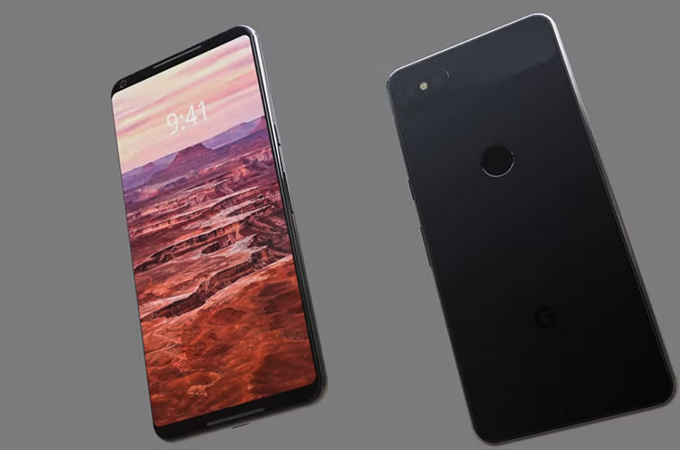 There is still no way to confirm if Newbie Mobile’s leaked render for the Pixel 3 and 3 XL are legit. We will find out on October 9.